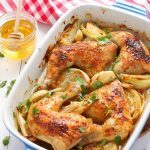 A super simple glazed chicken dish bursting with honey mustard flavour! Grease a large baking dish with some cooking spray (use butter if you prefer). I like to use my Misto Oil Sprayer (affiliate link) anytime I grease a pan. It's one of my favourite kitchen gadgets because it allows you to spray healthy oil without all those propellants found in conventional cooking sprays. Arrange the chicken legs in the greased baking dish and season each of them with sea salt and pepper to your taste. Stuff the chunks of onion and whole garlic cloves around the chicken legs. Whisk the honey and grainy mustard together in a small bowl and brush a small amount (about 1/4 of the mixture) onto the skin of the chicken legs. Place the baking dish in the oven and bake for 30 minutes. After 30 minutes, remove the baking pan from the oven. Baste the chicken with some of the juices in the bottom of the baking dish and brush the remaining honey mustard glaze onto the chicken legs and the onions. Return the dish to the oven and bake for 25-28 minutes more, or until the chicken reaches an internal temperature of 165 Fahrenheit (75 Celsius), broiling for the last 1-2 minutes to achieve that deep brown colour on the glazed skin. Add some cilantro leaves for garnish, if you wish, and serve!